I’ve posted earlier a number of stories, pictures and videos about the flying disc and some of the first expert players who also promoted the sport. Now here is the final part of another story sent to me by Audra Gonsalves, the wife of one of those pioneers, Ken Westerfield. It’s amazing how much of a difference just a few people can make in changing our culture and bringing the pleasures of a sport to millions of people. I posted Part 1 yesterday. 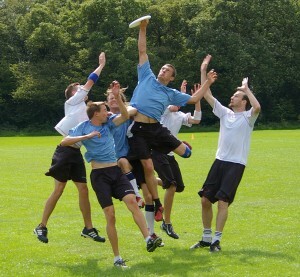 Frisbee (Disc) tournaments were beginning to attract excellent disc competitors from everywhere. What was once a top selling pastime with a toy from Wham-O was becoming a serious competitive sport. 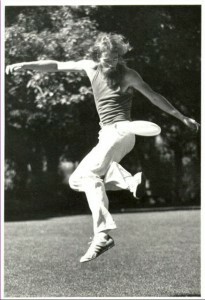 In 1975, at the Canadian Open Frisbee Championships in Toronto, Westerfield set the MTA (maximum time aloft) world record with a sidearm throw of 15 seconds, using a Super Pro Model Frisbee, crushing the old record of 11 seconds. 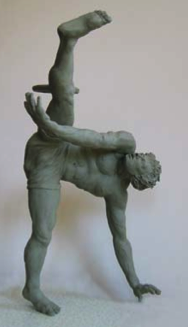 Also in 1975 Westerfield invented a freestyle move called body rolls, (rolling the disc across out stretched arms and chest, or back), then introduced the move at a national tournament in Rochester, NY called the AFDO, (American Flying Disc Open). 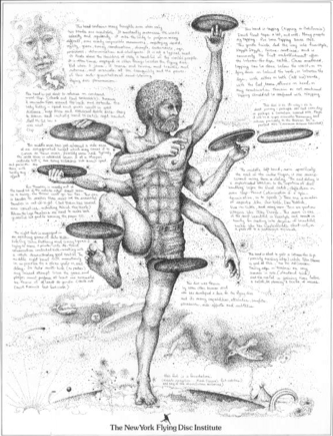 The hottest move of the day was called the Canadian Mind Blower: Westerfield would roll the Frisbee across outstretched arms and chest, to outstretched arms across the back (front to back roll). Today body rolls are an integral part of every freestyle routine. At a North American Series (NAS) Frisbee tournament in Dallas Texas, Westerfield became a member of the “400 club” with a prelim distance sidearm throw, and won the event with a throw of 378 feet, using a 119-gram World Class Model Frisbee. Only two competitors have officially ever thrown over 400 feet in competition with a 119-gram Frisbee (Lightweight disc by today’s standard). 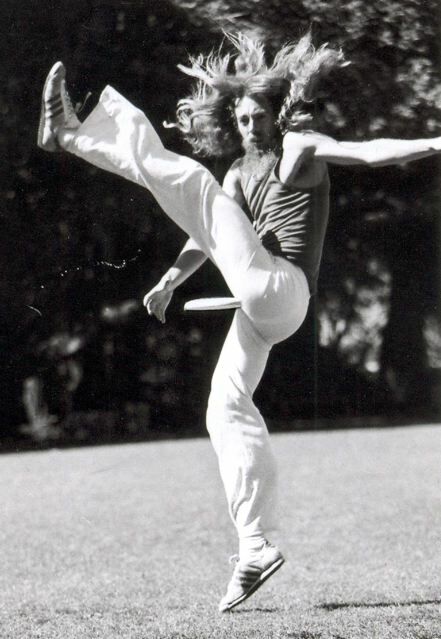 1978, in Boulder, Colorado, while doing a distance throwing demonstration at a North American Series (NAS) Event, Westerfield threw a sidearm 119-gram World Class Model Frisbee, 552 feet, shattering the official world distance record of 412 feet. “Someone paced off the distance to a building at 500 feet. Dave Johnson (former distance world record holder) and others we’re trying to hit it. Finally Dave hits the building and the crowd goes wild. Ken Westerfield was sitting and watching. After Dave hit the building the crowd started to yell for Ken to throw. At first Ken was dismissive, not interested. Finally Ken stood up, went to the line, sized up the task then let it fly. It landed in the parking lot past the building on his first throw with no warm up. The crowd went crazy. It was the most incredible throw I’d ever seen”. I’ve posted earlier a number of stories, pictures and videos about the flying disc and some of the first expert players who also promoted the sport. Now here is another story sent to me by Audra Gonsalves, the wife of one of those pioneers, Ken Westerfield. It’s amazing how much of a difference just a few people can make in changing our culture and bringing the pleasures of a sport to millions of people. In fact I just learned that nearly 300 million Frisbees have been sold since their introduction, and according to Mattel, which now owns the manufacturing rights, 90% of Americans have played with this flying toy at one time or another. And Frisbee is just one brand of many flying discs! I wrote this story with Ken’s referencing help. With the advancement and popularity of disc sports, Ken thought it important to make an accurate account of his history. From the early Frisbee days in New York, Ken knew everyone from the time of Gerry Lynas, Kerry, Krae and his father Ken, Peter Bloeme, Mark Danna, Jeff Felberbaum, Mountain, and many more. Ken played in Washington Square, Sheeps Meadow and at the Band Shell, back in the late 70’s while visiting with Krae and his father. In 1970 Westerfield and Kenner moved to Toronto, setting up their disc playing headquarters in Queen’s Park (Toronto). Playing Frisbee freestyle and Object Disc Golf, became a daily event at the park. In 1971 with a hundred dollars each, they started hitch hiking across Canada, stopping to do Frisbee street performance at popular annual events: the Klondike Days in Edmonton, Calgary Stampede in Alberta and in Vancouver’s historic Gastown area in front of a railroad car-turned-restaurant, oddly enough called Frisby’s. One night, while performing at Frisby’s, they decided they would try to collect money like street musicians. It was a success, and they embarked on a new career. I met Gerry Lynas 35 years ago, and have always respected his creativity. 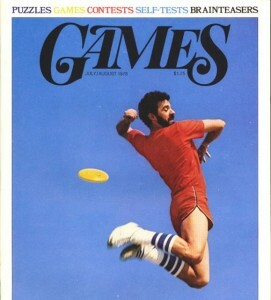 But I never appreciated until now how much he contributed to the sport, games, tournaments and graphics involving the flying disc…which most of us call a Frisbee. So here is the last of a three part series (in Gerry’s own words) about his significant influence to this sport and recreation for millions of us. You can also see his video and two by others at this earlier post . At 70 years of age, I play two or three times a week when possible in Central Park. Even though my arthritic body pays a painful price on the days after even modest jamming, I am still addicted to the many joys of freestyle and other disc games. I especially enjoy teaching young people who need instruction, small groups of neophytes, and kids in school, so I can spread the joy of this sport as widely as possible. I have also fallen in love with the Aerobee, a flying ring that has been thrown 1,335 feet. This is too long a distance for the Sheep Meadow or the Great Lawn in Central Park, so I have to limit my throws to under 1,000 feet. I once went political-environmental when I designed anti-nuclear stickers for discs that expressed my personal aversion to the proliferation of nuclear weapons, but I did not have the opportunity to use it very often. I did like the word play with “Let the Nuclear Freeze be”. In addition to playing disc sports or creating disc graphics at every opportunity, I also love making disc photographs and sculptures. Over these 54 years, the disc has built a family of close friends, an international community, and, for me, enabled countless encounters with friendly strangers from all over the world. In 1978, Krae Van Sickle and I were invited to a local beach to pose for the cover of Games Magazine. I couldn’t believe the editors chose a shot of me over one of Krae (probably the greatest player in the world). I even missed the catch as I was jumping from a tall boardwalk in order to have all sky in the background. The beach is freestyle heaven for me because I can jam solo for hours with a wet body that allows for multiple body rolls and flying leaps into the surf. MTA (Maximum Time Aloft) throws are huge and so beautiful as they float back in on the constant ocean breezes. 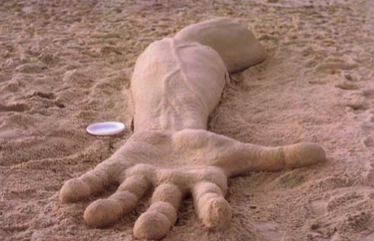 And, did I mention that the disc also happens to be the most amazing and versatile sand-sculpting tool ever invented? I met Gerry Lynas 35 years ago, and have always respected his creativity. 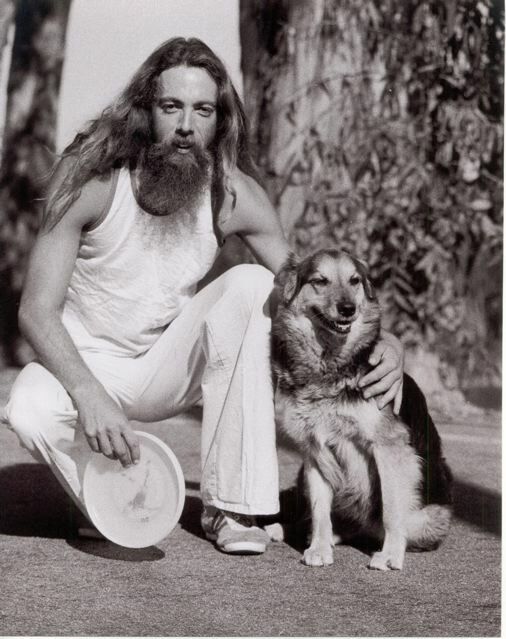 But I never appreciated until now how much he contributed to the sport, games, tournaments and graphics involving the flying disc…which most of us call a Frisbee. So here is the second of a three part series (in Gerry’s own words) about his significant influence to this sport and recreation for millions of us. You can also see his video and two by others at this earlier post . In my twenties I was more enthusiastic about competition, and thanks to a few loyal friends and a few willing players, I organized and ran three major disc tournaments in the 70’s and 80’s in New York City starting with the Big Apple Jam in June, 1976, in conjunction with the IFA. 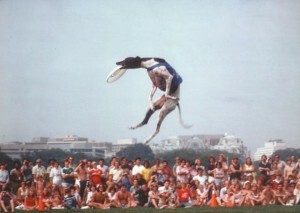 It was held at the World’s Fair Grounds in Queens and featured five events: Distance, Accuracy, MTA (Maximum Time Aloft), Freestyle Pairs and TRC. (Throw-Run-and-Catch is one of the hardest disciplines in the disc world. If you drop the disc, no score. If you catch (with one hand) your own throw farther than any other player, you win. It’s amazing. I think the record is more than 100 meters, but I’m not sure.) Kerry Kollmar was the reigning World Individual Freestyle Champion. The event was moderately successful, attracting 96 players from Canada and the US. Irv Kalb (Dr. I) took the overall NYFDI trophy, possibly the very first flying disc statuary. Soon thereafter, a group of us did a halftime demonstration at a basketball game at Madison Square Garden. I wanted to do a radical element with charged (glowing) Moonlighters in a darkened arena, but we were not permitted to turn off the lights. I opened the routine with a lucky, full court basket. The rest was pretty lame with a few drops. We weren’t ready for prime time. 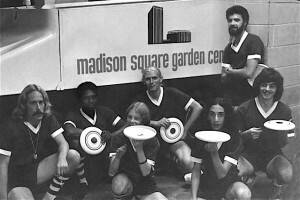 The second tournament I organized with the IFA was the Eastern National Frisbee Festival we called “Discover New York” in 1977. As tournaments became more sophisticated, judging (especially Freestyle) http://freestyledisc.org/index.jsp became more complicated. Finding willing and qualified judges who were not competing was difficult and judging was still far too subjective. Word spread after The Circular was passed around that I was an artist and graphic designer, so some of the players who had disc interests of their own began to ask me to design their logos and promotional materials. Within a few years I had designed logos for Krae Van Sickle’s Disc Dance. Krae was the most balletic and creative jammer I had ever seen. He and Jeff Felberbaum rehearsed and polished complex routines to music for events at schools, clubs, resorts, parties, etc. I created the first logo for the World Flying Disc Federation and was encouraged by the growing use of the generic term “flying disc,” which I had been using in the interest of fairness to other potential disc suppliers since my first Pluto Platter sailed through the air. As freestyle (probably my favorite discipline) grew more popular, it was inevitable that there would be an association. Freestyling was getting hotter and judging was slowly improving, but needed a manual for competitors to grasp the subtleties. I met Gerry Lynas 35 years ago, and have always respected his creativity. But I never appreciated until now how much he contributed to the sport, games, tournaments and graphics involving the flying disc…which most of us call a Frisbee. So here is the first of a three part series (in Gerry’s own words) about his significant influence to this sport and recreation for millions of us. You can also see his video and two by others at this earlier post . Something changed me when I was in high school 54 years ago. The plastic disc was invented and was commercially available for the first time as the Pluto Platter. It had flight characteristics unlike any ball and better than the usual pie pans or coffee can lids. It wanted to fly rather than fall. My dad called it a flying disc (not Frisbee), because he believed in using generic names, rather than commercial brands or newly invented words. Although the Pluto Platter was rather unsophisticated compared to modern flying discs, it was obvious to me, and a handful of other enthusiasts, that this toy had great potential as a unique sports implement. For me it was love at first flight. It replaced table tennis as my favorite recreation during college in Kansas City, Missouri and later in Des Moines, Iowa. I took discs to Portland, Oregon for Peace Corps Training and eventually to NYC in 1965. On the college campus in 1960, we started by playing throw and catch, but almost immediately discovered that different people threw differently. As we gathered in larger numbers, we invented simple games. The earliest game I remember was Circle Elimination, where we had to sit down if we failed to catch a well-thrown disc. Accuracy was probably the most natural objective in the evolution of these rudimentary games. Distance was also an early challenge. Those two skills combined naturally into a form of Golf with made up targets as we walked. An early form of Guts, evolved as a macho outlet for more aggressive types. Another game that some of us called Frisbee Football (now called Ultimate) was a natural for teams and used essentially the same rules as soccer. (Here is a link to the association’s site.) Early on, I enjoyed rolling discs on walls and skipping it on pavement. In college in bad weather, we moved indoors, playing Hall Disc off of walls, ceiling and floors. Watch the first 90 seconds of the video above to understand the rules of Ultimate, one of the many flying disc sports that is played with teams on a football field. This video of some of the best Ultimate footage captures the skill and dexterity needed in this sport. You are currently browsing the archives for the frisbee/flying disc/ultimate category.